or whether I am now a butterfly dreaming I am a man. If you watched the popular TV series "Lost," especially in the last season, you may have been puzzled by the various story lines and the different realities portrayed. There was the "present" reality of approximately 2004 when Oceanic Flight 815 originally crashed. There was the "flashback" reality for each of the main characters in which we saw glimpses of some unfinished business from their past. There was the "flash-forward" reality in which we saw the main characters back in LA after their rescue. There was the alternative reality of the 1970's which occurred after the "donkey wheel" was turned to cause a series of time-traveling flashes. And then there was the "sideways" reality that showed us an alternate universe in the lives of the main characters as if Oceanic Flight 815 had never crashed, but safely landed in LAX. All these converging realities caused lots of controversy, confusion, and suspicion as to whether the writers of "Lost" really had any kind of plan, or if they, too, were "lost." We could probably explore the various theories of "Lost" forever, and there are still many unanswered questions. But the relevance here is that the writers of "Lost" were tapping into the concept that there are many dimensions of reality and that reality can have many interpretations; the individual characters in the show perceived events through the lens of their own life experiences. So the ramifications of all the realities portrayed in "Lost" underscores the idea that reality is fluid. Reality is subject to individual perception! We do live in a collective mind, or a kind of "collective hypnosis" that comes from our cultural conditioning in which we perceive reality communally, as well as simultaneously perceiving it individually. This partly explains why there are so many Tarot decks out there -- each of us, on some level, perceives reality individually. We each have our own interpretation of reality. For example, if everyone who is reading Pathways right now was asked to draw a picture of the concept of "love," how many pictures would be the same? Or, if we each drew a picture of "teacher," how many would be the same? This individual interpretation of reality takes expression in a multitude of Tarot decks that are available for purchase and admiration. In fact, if you have been thinking about purchasing a Tarot deck for yourself or as a gift for someone, you may feel overwhelmed by the number of Tarot decks from which to choose. There is an explosion of new decks, which makes the selection of a deck quite exciting, but also more challenging. As you begin to look around at the different decks, you will find that this multitude of decks is both a reflection of the diversity of humanity as well as an indication of the exciting rebirth of interest in the Tarot. Why are there so many decks? Which is the “true” deck? There are so many decks because the interpretation and creation of a Tarot deck is like any creative endeavor - - it is subject to the abilities, perceptions, conditioning and experiences of the creator. We each perceive and portray aspects of life from our own unique vision, with our own personal interpretation. Since the 78 cards in the Tarot deck portray our earthly and spiritual journeys, the different decks embody this individual interpretation of our journey. The Rider-Waite deck, developed by Arthur Edward Waite and illustrated by Pamela Coleman Smith in 1909, is considered to be the “standard” deck and is often considered to be a good “beginner” deck. Most decks are based on this standard since the Rider-Waite is considered to be a “pure” representation of the Tarot’s symbols. There are several versions of the Rider-Waite deck including the Original Rider-Waite, the Albano-Waite, the Universal-Waite, the Radiant Rider-Waite (See the Moon card from the Radiant Rider-Waite Tarot) and the Golden-Rider. The symbolism is exactly the same in each of these, but the color scheme is different with some of the Rider Waite versions having more vibrant colors and some with more muted colors. When you are first starting out, it may be useful to work with a “basic” deck like Rider-Waite, especially if you are planning to memorize the meanings of the cards. Those memories can then be used to trigger your inner psychic voice. However, if you feel that a certain deck calls to you and speaks to you and allows you to access your inner voice more readily, then by all means, try it. The deck you use can be compared to the choices you make about a computer system. Certain software is more “user-friendly” allowing you to intuitively access the data within the computer more easily. Similarly, some decks will just work better for you, and if you are feeling blocked when using a certain deck, even though you have tried and tried, this may signal that it is time to choose another deck. The goal is to find a deck that “resonates” with who you are and what you believe to be the higher spiritual truths. So now we understand that different artists interpret the Tarot symbols in various ways, each adding their own perspective. The individual archetypes of the Tarot system are interpreted individually, but the overall theme of the Tarot system is also subject to personal interpretation as well. Thus, there are also many themes that can correspond with the Tarot system - there are thousands of decks available, catering to many diverse interests, from baseball to rock and roll. In fact, there's a Tarot deck to match just about every interest or belief. For example, there is a deck based on the life and times of William Shakespeare, the Shakespearean Tarot. There are decks based on Native American traditions and those based on mythological traditions, such as the Mythic Deck (See the Sun Card representing Apollo from the Mythic Tarot). 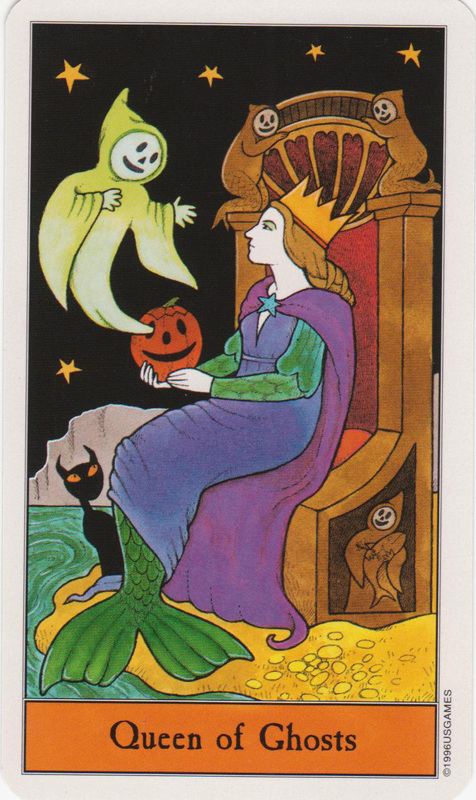 There is a Halloween deck (See the Queen of Ghosts from the Halloween Deck); there is the Russian Tarot of St. Petersburg; there is a deck that has a multi-ethnic and multi-cultural portrayal of the symbols called the Ancestral Path Tarot; a Tarot of the Cat People; a feminist deck, the Motherpeace Round Tarot Deck. There’s a deck for those interested in herbs and plants called the Herbal Tarot Deck; a deck based on the teachings of Zen called the Osho Zen Tarot Deck; a deck that incorporates astrology called the Symbolon deck; a deck that uses the game of baseball as its symbolism, the Tarot of Baseball Deck. There is a deck based on fairy tales called the Inner Child Tarot; there’s a deck based on “pop” culture called the Pomo Tarot Deck; there’s a deck based on Arthurian legends called the Arthurian Tarot Deck; a deck based on the works of Salvador Dali, a deck based on ancient Africa called the Tarot of the Orishas, and the Rock 'n Roll Tarot based on rock legends (See the Elvis/Emperor card from the Rock and Roll Tarot); a deck based on the life of Jesus Christ called The Masters Tarot, and many more. There are also ethnic decks such as The African American Tarot, Japanese decks such as Ukiyoe Tarot (See the Strength card from the Ukiyoe Tarot), Australian decks, such as the Australian Contemporary Dreamtime Tarot, a Chinese deck called the China Tarot, and so on. It can take your breath away to think about this diversity. Each deck brings something creative, different and distinctive to the Tarot world. Besides decks that are constructed around a particular theme or ethnicity, there are decks that capture a positive, optimistic and playful world view like the Hanson Roberts Tarot (See the Six of Cups from the Hanson Roberts Tarot). There are decks that capture a dark, more somber world view, such as the Bohemian Gothic Tarot (See the Ten of Swords from the Bohemian Gothic Tarot). See what I mean? There is something for everyone. And the best part is that mass-produced decks are not expensive -- they range in price from $12 to $35 depending on whether there is an accompanying book. So many decks! I confess, I am a Tarot deck addict. Although I have never counted all my decks, I suspect it is over 100. No matter how many I have, it may never be enough! Each deck is unique and marvelous in its own way. I love looking at how the creator/artist of the deck captures the meaning and energy of the archetype. It is fascinating to see that little window into another's psyche and to see the world through someone else's eyes. It is thrilling to see an archetype's meaning conveyed in a new and fresh way that deepens the understanding of the archetype. Like a brand new car that has that clean, new car smell, there is nothing like the thrill of opening a new Tarot deck and then flipping through the cards in their pristine, pure condition. Is it bad luck to buy your own Tarot cards? Some people believe that you should never buy your own deck, but that your deck should be given to you as a gift. I am not sure where or how this myth started, but it is NOT bad luck to purchase your own deck. By purchasing your own deck, you can be sure that you are choosing a philosophy, style and art that is compatible with your tastes and resonates with who you are. But of course, gifts of Tarot decks are always welcome! Experiment with deck selections. (Note: to see a stunning array of colored pictures of many decks, visit www.aeclectic.net or call US Games at 1-800-544-2637 for their fantastic color catalogue). Once you settle on a deck, you should start slowly, working with only the Major Arcana for a while, until you feel comfortable with these 22 cards. (Note: there are 78 cards in a Tarot deck and these consist of 3 "sub-decks:" the 22 Major Arcana, the 16 Court Cards and the 40 Minor Arcana cards). When reading the cards for others, or when you are meditating on a card for yourself, the ideal is to allow the symbols on the cards to trigger flashes of insight. The insight that is released by the Tarot’s ancient symbols then combines with the knowledge gained from studying the Tarot, and with your life experiences, to produce an interpretation. Go slowly -- study a variety of books, with a variety of teachers, learn the traditional meanings for each of the Major Arcana cards, and ultimately you will be able to allow your unconscious mind to take over. Once you’ve become more adept at working with your first deck, you may want to have different decks for different occasions. For example, I have a special deck called the Illuminated Tarot (self-published by Carol Herzer at www.soul-guidance.com (See the Hermit from the Illuminated Tarot). I use this deck strictly for my own personal readings -- no one has ever touched it before (other than the person who made the deck). I use a large-sized Rider-Waite deck for teaching. I use the Morgan Greer deck for doing readings for others. I use the Osho Zen Tarot deck for my daily meditations. Each of these decks speaks to me in a different way and enables me to contact different parts of myself according to the situation and goal at hand. Others of my personal favorites include the self-published Gaian Tarot (See the Temperance card from the Gaian Tarot which can be purchased at www.gaianTarot.com) and the Druidcraft Tarot. Most of these decks can be purchased on Amazon or through US Games, Inc. (www.usgamesinc.com) or at most of the major chain bookstores. Ultimately, the selection of a deck is strictly a personal choice. The deck you work with can become a part of your identity or your psyche; it reflects who you are, what you seek from life and where your spiritual path is leading. Reading the Tarot is a creative process and you should remember that the goal is to develop and access your intuitive voice. The selection of the deck can be the first step in trusting your intuition. Author Cheri Huber said, That which you are seeking is causing you to seek. Quietly listen to your inner voice when you feel drawn to a certain deck. Look at several decks, experiment with different decks. Use the deck and the system that calls to you.Believe that the right deck will be drawn to you, as you will be drawn to it.